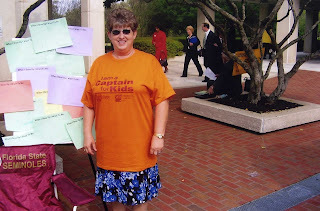 ELDER Captain, Carolyn Palmer wearing her "I Am a Captain for Kids", after inviting Florida's Governor Charlie Crist, to support degreed teachers in pre-Kindergarten classrooms during Children's Week in Tallahassee March 26th. We salute Governor Crist for speaking in support of high quality early learning for Florida's four-year olds. Like Florida's former governors who serve as honorary co-chairs of Generations United's Seniors4Kids, the current governor recognizes that the most effective preschool teachers are those with at least a four-year degree and specialized training in early childhood. 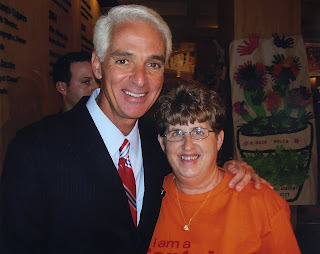 Age 50+ Floridians participating in GU's Seniors4Kids have cause to celebrate Governor Crist's statements, and will continue to educate state legislators about why high quality pre-Kindergarten is so important to them and the future of their state.